A standing child whose knees touch but ankles do not, is usually said to have knock knees. During childhood,knock knees are a part of normal growth and development. They usually become apparent when a child is around 2 to 3 years old and may increase in severity until about age 4. If this condition does not appear until a child is 6 years of age or older, however, an underlying bone disease may be present. Severe knock knees usually restrict a child’s physical activities. The child cannot run easily and may not want to participate in sports or other physical activities. If knock knees persist into adolescence, problems of appearance as well as difficulty in physical activity may also arise. Knock knees most often develop as a part of natural growth. Diseases, such as osteomyelitis (a disease of the bone) and rickets, may cause permanent knock knees. 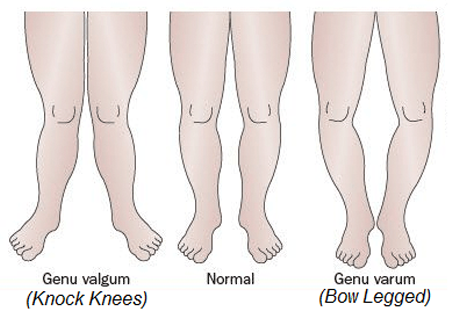 Injury to the growth area usually occurs in one leg only, resulting in one knocked knee. Your personal preference of treatment. A mild case of knock knees will usually require no treatment, as it corrects itself. More severe cases may require the use of orthopaedic appliances such as orthotics, a night brace or orthopaedic shoes. If there is pain and discomfort, at Children’s Podiatry Clinic we are able to assess your child and provide appropriate treatment options and advice. If you are concerned or your child is complaining of toe pain then it is best to take them to see a Podiatrist.